For those who want in on Fuji’s X Series system without a big financial investment, the updated Fuji X-A5 makes a good entry point, especially if your priority is image quality. Offering a similar, but updated, 24MP Bayer-filtered APS-C sensor, the X-A5 provides some of the best image quality performance, at both low and high ISOs, we’ve seen from an entry-level camera around the $600 price point. Despite a new hybrid AF system and image processor, its performance, however, isn’t overly impressive, with slower-than-average AF speed, sluggish shot-to-shot times and a shallow RAW buffer. Still, the Fuji X-A5 makes for a great entry-level camera and is a solid bargain when it comes to image quality. Below are crops from our laboratory Still Life target comparing the Fuji X-A5’s image quality to its predecessor’s, the X-A3, as well as against several competing entry-level mirrorless cameras at similar price points: the Canon EOS M6, Olympus E-PL9, Panasonic GX850 and Sony A6000. NOTE: These images are from best quality JPEGs straight out of the camera, at default settings including noise reduction and using the camera’s actual base ISO (not extended ISO settings). All cameras in this comparison were shot with our very sharp reference lenses. Clicking any crop will take you to a carrier page where you can click once again to access the full resolution image as delivered straight from the camera. For those interested in working with the RAW files involved, click these links to visit each camera’s respective sample image thumbnail page: Fuji X-A5, Fuji X-A3, Canon M6, Olympus E-PL9, Panasonic GX850, and Sony A6000 — links to the RAW files appear beneath those for the JPEG images, wherever we have them. Above we compare X-A5 image quality at base ISO to its predecessor, the X-A3, which also uses a 24-megapixel Bayer-filtered APS-C sensor, though without integrated PDAF pixels. As expected, image quality is very similar at ISO 200 with both cameras providing very crisp, detailed images but that contain really obvious sharpening halos around high-contrast edges, as well as the exaggeration of subtle textures and details. This is especially noticeable in the solid background of “Mas Portel” bottle label where it appears “noisy”, and even the subtle label adhesive pattern is amplified to the point of being readily visible. Default sharpening is definitely very aggressive from both cameras. The X-A5’s image is a bit sharper, but this is mostly due to the different lenses used, as we had to retire our Fujinon 60mm f/2.4 lens used with the X-A3 as it was no longer manually focusing reliably. We will probably switch to the Fujinon 56mm f/1.2 in the long term, but in the meantime the X-A5 shots here were taken with the Fujinon 90mm f/2 which is a bit sharper than the 60mm lens at f/8. Still, it appears Fuji has tweaked default JPEG processing as well, producing slightly higher contrast and revising noise reduction to do a better job at preserving fine detail. Colors are also a bit warmer from the X-A5, but that just appears to be due to slightly better custom white balance. 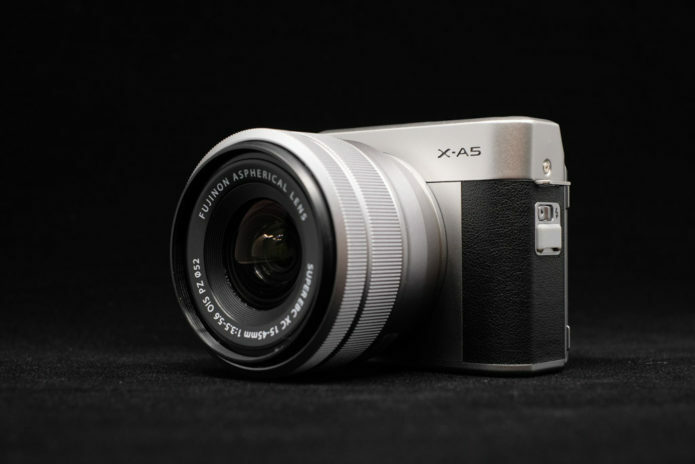 Above we compare the X-A5 to the Canon M6, another 24-megapixel APS-C mirrorless camera. Both images show noticeable sharpening halos along high-contrast edges, but the X-A5’s are much more obtrusive, however the Fuji image is much crisper and more detailed. When looking closely at the images, you can see that the X-A5 image has higher luma noise than the M6 in the shadows, but keep in mind its higher base ISO. The X-A5 image however has lower chroma noise than the M6. Contrast is much higher from the Canon in our tricky red-leaf swatch giving the impression of greater detail, however the two cameras capture about the same amount of subtle detail. Both cameras produce pleasing color but the Fuji’s colors are warmer and generally more saturated. Here we compare the X-A5 to the 16-megapixel Micro Four Thirds Olympus E-PL9. Both cameras produce very sharp images with visible sharpening artifacts here at base ISO, though again the halos are more obvious from the Fuji around high-contrast elements. The 24-megapixel X-A5 out-resolves the E-PL9 though the Olympus offers somewhat higher contrast which helps it to appear a little crisper than the X-A5 in some areas. Noise is actually lower from the E-PL9 however its JPEG engine does generate a few unwanted artifacts while smoothing it out. Both cameras produce pleasing color, though the Fuji’s are a little brighter. Here we compare the X-A5 to another entry-level mirrorless camera, the Panasonic GX850. The 24-megapixel X-A5 easily out-resolves the 16-megapixel GX850 while offering lower noise levels, however the GX850 produces a somewhat more natural-looking image with less noticeable sharpening halos. Contrast and detail are also better from the GX850 in our tricky red-leaf swatch, however overall contrast is higher from the Fuji, with brighter and more pleasing colors as well. Both these rivals use similar 24-megapixel APS-C sensors and thus resolve very similar amounts of detail, however Fuji’s processing produces a crisper, sharper image with strong haloing while the Sony’s sharpening algorithm produces almost no sharpening halos. The X-A5’s colors are more vibrant, warmer and more accurate, though the Sony retains some of the offset printing coloration in the mosaic crop that the Fuji pretty much eliminates. The Sony also produces much higher contrast and better detail in our tricky red-leaf fabric. Fairly similar image quality from the two Fuji siblings here at ISO 1600, though again, the X-A5 image appears a little sharper, contrastier and slightly more detailed, likely at least in part because of the better lens. Luma noise levels appear a little higher from the X-A5, though, perhaps the result of somewhat stronger default sharpening as noise levels in RAW files appear quite similar. Still, these entry-level Fujis offer some of the best high ISO performance we’ve seen from an APS-C camera. The Fuji X-A5 produces a much sharper, crisper, cleaner and more detailed image here at ISO 1600 compared to the Canon M6. Colors continue to be brighter and more vibrant from the Fuji as well. The X-A5 continues to out-resolve the E-PL9 here at ISO 1600, though its luma noise levels are higher in flatter areas. The E-PL9 works hard at smoothing away noise while still doing a good job of holding onto fine detail, however it does generate more noise reduction artifacts. The X-A5 pulls further away from the GX850 here at ISO 1600, with lower noise, more detail, higher contrast and better color, although sharpening halos remain more obvious from the Fuji. The X-A5 produces a crisper, more detailed image sharper but with noticeable haloing and slightly higher noise levels than the A6000. The Sony produces much higher contrast in our tricky red-leaf swatch, however it’s starting to distort the pattern more than the Fuji. The X-A5’s colors remain more vibrant, warmer and more accurate. Once again, we see a sharper, crisper and better detailed image from the X-A5 compared to its predecessor here at ISO 3200. Again, much of the improvement is likely due to the sharper lens, but it appears the tone curve and default processing have been improved as well. There’s really no contest here at ISO 3200, with the X-A5 producing a much crisper, detailed image with better color and lower noise levels, at least in the shadows and mid-tones. In brighter areas, the Canon is actually cleaner, likely in part due to its far less aggressive sharpening. The M6 also produces better contrast in our troublesome red-leaf swatch, though fine detail is actually a bit better from the Fuji. Similar to what we saw at ISO 1600, the X-A5 retains more detail and produces a crisper, more vibrant image with fewer noise reduction artifacts. Noise levels are similar in flatter areas, however the Fuji’s grain pattern has a less consistent nature than the E-PL9’s. The X-A5 still comes out ahead here at ISO 3200 with much better detail in most areas, lower noise with a tighter and more natural-looking “grain” pattern, and more pleasing colors. Both cameras really struggle with fine detail in our tricky red-leaf swatch, blurring most of it away, but the GX850 renders slightly better contrast. This is an easy win for the Fuji, producing a much crisper, clearer and more vibrant image than the Sony. The A6000’s heavy-handed noise reduction smears away a lot of fine detail, and what appears to be better detail in our red-leaf swatch is heavily distorted and false. Detail comparison. High-contrast detail is also important, pushing the camera in different ways, so we like to look at it, too. Here, we can see the X-A5 outperforms its predecessor, the X-A3, with better sharpness and contrast across the ISO range, though keep in mind the slightly sharper lens. The X-A5 performs very well compared to the Canon M6, with better sharpness and contrast, and less of a drop-off in image quality is sensitivity rises. The Olympus E-PL9 does well with high-contrast detail, almost keeping pace with the Fuji, though it can’t quite compete in terms of resolution. The Panasonic GX850 isn’t as sharp or contrasty and also can’t quite compete in terms of resolving power. The Sony A6000 arguably does better than the X-A5 at base ISO due to its more refined processing and lack of sharpening haloes, but the X-A5 pulls away at higher ISOs with better clarity and fewer false colors.